You can earn 1000 yards with this purchase! 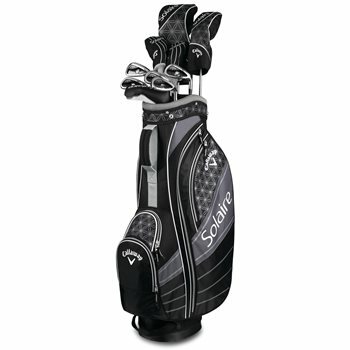 The Callaway Solaire 11-Piece Sport complete club set is designed specifically for a woman’s swing. It features longer and more forgiving irons, fairway woods and hybrids with slightly larger faces that are easy to hit and launch high and a driver that delivers longer, straighter drives more often. The set includes a high performance driver, an easy launching 3 wood , 5 and 6 hybrids, oversized 7 thru 9 irons, pitching wedge, sand wedge and an easy to align Odyssey putter. A stylish, matching sporty stand bag completes the set for those who like to walk the course.